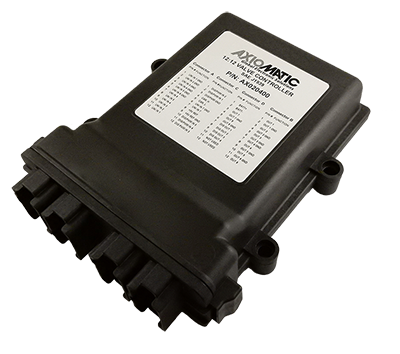 The valve controller drives 8 proportional or on/off solenoids plus 4 on/off solenoids. It is networked on a SAE J1939 bus. Up to 7 signal inputs and 5 digital inputs are accepted for interface to a PLC, Engine Control Module, switches, command potentiometers or sensors. It operates with 12Vdc or 24Vdc power. Designed for rugged machine applications, it features an IP67 rating and is suitable for high vibration installations. Controller settings are user configurable to suit many applications.